Sorry for being dense. I am not sure I understand. The 19 year old missionary is titled Elder, right? I thought once an elder, one was an elder for his whole life. Certainly Richard Turley Jr. is an elder, no? Brother seems a title that even I am called by members of our ward. Is there some distinction in the title other than for a non-president general authority? I ask because I am not always sure what title to use for men. Thanks for the clarification. Holding the office of elder in the Melchizedek Priesthood does not mean one is ordinarily given that title. It is reserved for General Authorities and, as you have indicated here, male missionaries, be they younger or older. Should a church historian be an actual historian, or should they not? If not, why call it church historian? Why not call it "managing director of the church history department?" The calling of Church Historian and Recorder is to keep the records of the Church. That's it, that's all. To ensure what is happening is being recorded for posterity so there can be a record worthy of acceptance. Any idea of it being a position of academia or scholarship simply misunderstands the calling. If they are maintaining the records and ensuring new events are added they are doing their duty. Arrington being a professional historian who wrote on Church History is an exception, not a requirement for the calling. Thanks so much. I did not know this. If I understand you correctly then it is best that I use the term Brother to refer to other male members of our ward? I am almost always referred to as Brother . . . is there anything offensive in my use of the term, as a non-Member for male members of the Church? I really just want to not be offensive or inappropriate in any way. Thank you for your time in answering my basic questions. 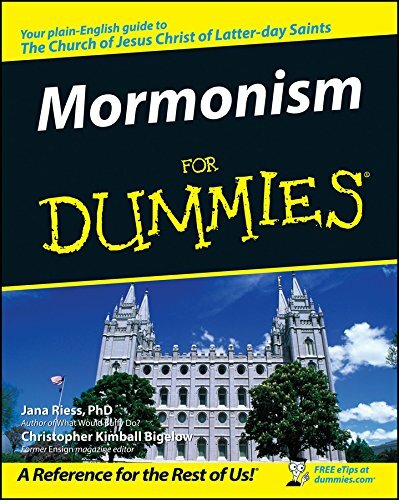 Sometimes I wish there were a class in Mormonism for Dummies! You will never go wrong in addressing male Church members as Brother. Even General Authorities sometimes use that title in addressing each other. When I worked in a church bookstore, I remember thinking this was a useful book. While written for a convert, it is about things that are often automatic for longtime members. Then we should not be calling them historians. We should be calling them church recorders. No, not at all! As all of us are children of God, it follows, then, that we're all brothers and sisters! Hence, the not-infrequent invocation of those titles to recognize and to reinforce that fact. While I was known as "Elder G" (using my full last name) while serving as a full-time missionary, honestly, the appellation I favor most in the Church of Jesus Christ of Latter-day Saints, and which has been used most often by leaders under whom I have served with whom I have had the strongest sense of camaraderie and kinship, is plain, old "Brother Ken." Indeed. Not infrequently, in General Conference, if a counselor in the First Presidency conducts, he will note, "President [Name], who presides at this conference, has asked that I, Brother [Name], conduct." I don't think that it's simply an affectation intended to "throw a bone to the little people," either (my phrase). I think it's entirely genuine. According to Wikipedia, it is only since the late 19th Century that historian has been a professional or academic occupation. Yes. I was thinking specifically of that phrasing. I can just see the struggle of trying to find professionals for the calling of "ward historian". While I was a ward clerk, the bishop asked me to serve as the ward historian. Should I have been an actual historian? My function in that calling was to collect information about things happening in the ward, including from the secretaries of the various organizations, and record them for the purpose of sending to SLC every year. But I couldn't have answered every question about what happened in the ward since its founding. It's easier to call him Church Historian. Would it make any difference to someone who is angry about church history if the church historian was actually called "managing director of the church history department"? Titles of officers in many fields often imply things about the officer that may not be the case. For example, in most counties in the United States there is the office of Coroner. Coroners are in charge of death investigations. Qualifications for the office vary. Sometimes the Coroner is an appointed position, sometimes an elected position. In my home state (Washington) it's an elective office, and practically anyone can be elected to it, including people who aren't medically trained at all. Unless they're qualified medical examiners, Coroners don't do autopsies. Their main job is management of the Coroner's office, and the supervision of medical examinations. It's normally a political office. Expecting a Coroner to know everything about death investigations is unrealistic. Even functional specialists don't know everything. It is a little confusing. While all who hold the Melchizedek Priesthood should technically be called Elder, we reserve that title for serving missionaries and General Authorities. This does not describe that difference, but titles of the Priesthood in general. Women are just always called Sister at this point, there is some discussion this may change soon. I am going to see if I can find something specific to how we use Elder. What's the deal with having non historians be the church historian? Probably the same deal with having non teachers be teachers and non secretaries be secretaries and non clerks be clerks. We are a lay organization without professional training for our callings. We expect people's life experiences to provide most training plus additional in the job training and manuals and some training meetings to help. The Church History Department is filled with wonderfully trained professional historians who are faithful members of the Church. I have hosted and know a number of them. I am constantly pleased with their knowledge of the history of the Church of Jesus Christ of Latter-day Saints and their spiritual maturity and personal commitment to both their work and their faith. I need to check this out. The author is one of the keynote speakers at this year's MHA conference. I just finished the Leonard Arrington book by Greg Prince. Arrington is an example of a professional historian who brought the real discipline of history to the church history department. A really bad example of a church historian who had no business being in that office is Joseph Fielding Smith. He literally cut one of the most important historical artifacts out of Joseph Smith's journal. Another is Turley and Jensen and the Swedish rescue. They gave a bunch of non-answers, tap dances, and misdirection to sincerely troubled and questioning members. To claim the environment was "hostile" is silly--we don't know that; we have no evidence of that. Serious, sure. Earnest, yes. Hostile? Hardly. Being in the position of official historian for any organization requires that you actually know and study its history. Jensen and Turley clearly do and did not. Yes, there are historical questions for which we don't have an answer. The correct approach is not to tip-toe around the question with misdirection and obfuscation, it is to say "I'm not aware of a good answer for that, but I will research it and get back to you." I believe many accomplished historians will attest that there are few individuals with a more thorough and competent command of the history of the Church than Turley. And I think there is already a managing director of the department. The position of Church Historian and Recorder is an ecclesiastical one, not a bureaucratic one.